There is a time for sitting with unhappy feelings and thoughts as we acknowledge reality and process. However, after a while, it changes, and we are just sifting through rotting garbage. This Tuesday, we are all about lightening the mood. 1. Realize that the heavy mood is becoming too much and unhelpful. 3. Video Games: Whether you are solving a puzzle, swinging the Wii-mote, or racing your car, focusing your concentration on a game for a bit is a great way to switch gears. 4. Soap Operas: The combination of ultra-seriousness and absurdity is agreat way to finish flushing out feelings of drama and revenge. 5. Sing: Pick something light, bright, and joyful, and sing it loudly. 6. Move: Take a walk, dance, or exercise to shake out the tension stored in your body, and your mind and heart will take the hint. 7. Bake/Cook: Whether making something for ourselves or to share, a special yummy brightens the day. 8. Sunshine: Get out and let some of that natural light do what it does for us. 9. Snuggle: Find that special someone and be close. 10. Laugh: Whether we find something to tickle the funny bone or just let loose because we could see how ridiculous we had become, laughter gets the good brain chemistry going. Meanwhile, the needles are clicking along with the baby knits and hopes of being in the zone enough to crank out a few more. The mitten survived, and the only knitting left on it is the thumb. I started its mate, and have made it to the same point as I was with the first when you saw it last. The time is here for me to make some decisions about baby knitting. Amongst family and friends, I think there are four babies almost ready for life on the outs, and not all of them are getting handknits from me. Then again, sometimes I get going with the baby knits, and I just want to knit more of them, and some days I think a trip to Babies 'r' Us might be fatal for me, and everyone at that store has enough going on without me dying there. The head of the puppet benefited from a rip and re-knit. Now it sits and waits. I am just not feeling it, and for finishing work on projects likes these, concentration and desire are requirements. They take much fiddling and fussing, and are totally worth the effort, but when the heart is not in it, setting the piece aside is best. 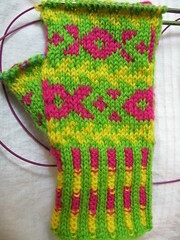 Since it was a no-go with Sini, I began a pair of mittens. I chose bright colors, and a fun, yet not terribly complicated pattern. I made it through the cuff, completed the thumb gusset plus a bit more, and now I feel like ripping out everything and tossing it back in the stash. 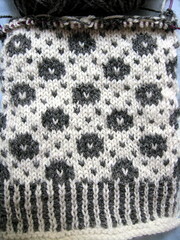 Since I know the mitten looks fine, and that part of it is that I am off my game, I have not done anything just yet. However, it only has another day or so to go, as I do not want another thing to linger on the needles just waiting. The upside of the meh has yet to reveal itself. Perhaps I will catch up on household chores, or maybe I will exercise more. Either of those would be fabulous. I could possibly finish reading a book or two, and that would be good, too. Ah, the options spread out before me in waves, or perhaps that is just sleepiness finally settling in on me. It is either time to knit the ears for my puppet, or I need to rip back and redo its head. It can be difficult to tell if it is right before blocking and stuffing. Either way, I am glad that I realized that the ear portion of the pattern in my copy of Spin Off is incomplete. The correct information is here. However, for now, none of it matters much, as a torn fingernail means knitting and spinning are temporarily on hold. Yeah, that about sums up the excitement level and what I am doing right now. Beach Glass is blocking, but it should not take long before I can get it in the mail. Well, there is my track record of not getting packages off to where they ought to go in the timeliest fashion, but since there is no deadline or expectation of the arrival of either, I think I will be fine. Oh, and speaking of that, I received a piece of mail the other day. All that was recognizable was my return address label and the uncanceled stamp. It had gotten wet, and the mailing address washed away. It was a birthday card for a friend. To add insult to injury, it would have been on time, and I rarely ever accomplish that. Ah, but I am getting off track a bit, or am I? Did I have a point? Oh, I did have a list for Ten on Tuesday, but I had read the topic incorrectly, and had Ten Reasons to Not Love Bacon. Once I realized my error, I had lost any enthusiasm for making a new post, but was hungry for bacon, and feeling bad about myself. Since I like all of the Estonian Hand Puppet patterns, I decided to go with the most popular, and I am working round and round on Sini. The colorwork pattern is easy to remember, and making my way through the rounds seems faster than what my progress shows. I have begun thinking about making more of these, as they are so cute. A plan to spin and knit one out of alpaca amuses me, but I do know that I can sometimes be amused easily. 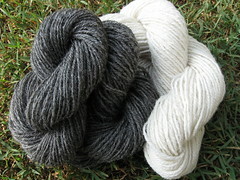 New yarns are here! While I have not fallen off the wagon, I have recently felt strong urges to buy more yarn, but that might be a story for another day. The spinning of these began during the Tour de Fleece, but I needed to give my hands a rest, so there was a break between the two. I had been enjoying the spinning so much, it was a bit of a challenge to wait, but it was for the best. I spun the lighter first, and just finished the darker yesterday. Spinning three-ply yarns seemed like the obvious choice, and I do like my results. Now all that remains is choosing which to knit. So, what do you think, will it be Kriimu, Kirju, Pilve, or Sini? It hardly seems that I can be over 67% finished with knitting this Beach Glass Shawl, but according to Rose-Kim Knits' wonderful Shawl Progress Calculator, I am. It took me a bit to begin the shawl. I just could not cast on all 388 stitches at once, so I would add in increments of 50, place a marker, set it aside, spin, and repeat. The upside of doing it that way was that I took breaks from the wheel, I completed the cast on without losing noticeable amounts of sanity, and there was less counting involved when I needed to add the center marker for the shawl. There are still enough stitches in each row to keep them from being spread out all the way on the needle, but the rows are noticeably shorter for me. 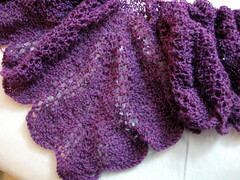 I love the rhythm of this lace as its waves grow in a comforting rhythm. Knitting it is such a joy, made greater as I think of the friend who will receive it. So, this week's Ten on Tuesday topic is: Ten Things to Bring on Vacation. A book, iPod, camera, and knitting popped into my head immediately. Then, I mulled it over some more and thought about different ways to approach the topic. I could not settle on just one, so I present you with three vacation-packing scenarios.